My Little Shoebox's new Imagine A Forest line is simply adorable! The colorful trees and cute squirrels with polka dot and striped tails set the tone for your whimsical projects. Of course nowadays, no project is complete without a touch of Shimmerz! 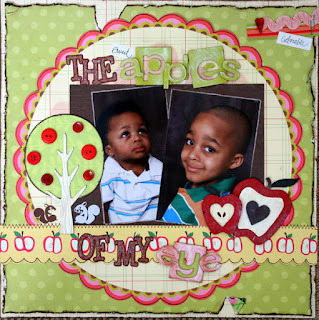 These cute chipboard apples are from magistical memories. I covered them with acrylic paint and then sprayed the red portion with Shimmerz Barn Yard Red shimmering spritz. 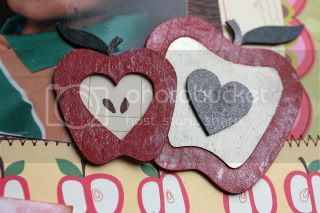 I inked the chipboard heart and then painted it and the stems with Choc-O-Lat shimmerz. I painted the inside of the apple white, it was too bright for the page, so I toned down the color by painting it with gold glimmer blingz. 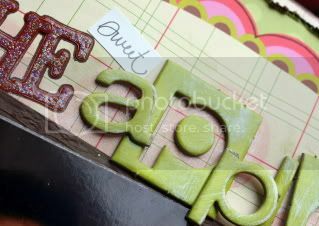 I gave a little oomph to the negative space of my chipboard letters by spritzing barn yard shimmering spritz to the patterned paper beneath it. See how easy it is to apply shimmerz to any part of your projects? Cute, cute page! I love those shimmery apples! This is fantastic! I love how you did the title! What adorable apples they are. WONDERFUL!! !